Tired of malls, beaches, caves, mountains as a tourist destination? Are you a health advocate wanting a singular experience or at least a novel experience? No need to look far, La Trinidad in Benguet might just have what it takes to satisfy your longing - an organic farm. Try experiencing farm life, learn about organic farming, taste the freshness and richness of the province’s local cuisine while enjoying the cozy, serene, and natural ambiance of an eco-agricultural site. This is what the Jaime V. Ongpin Foundation Inc (JVOFI)-Benguet Provincial Government-La Trinidad Organic Producers (LaTOP) cooperative and other stakeholders are offering in a new project being funded by the Australian Assistance for International Development (AusAID). In a forum at the Benguet Provincial Capitol, JVOFI executive director Ma. Rosario Lopez explained that the project, dubbed ‘Replicating LaTOP Success through Capacity Building and Sustainable Eco Tourism,’ is a follow-up of their previous project in partnership with AusAID that worked for the up-scaling of organic production in Baguio and Benguet. “This time, it is the first eco-tourism project here that would showcase our organic farms that aims to showcase unique tourism destinations to both local and foreign tourists, which, aside from providing an additional livelihood or income to our organic veggie farmers, the project also hopes to heighten awareness on organic farming that is essential in the conservation of our environment,” Lopez said. According to LaTOP member Jeff Laruan, owner of the Lily of the Valley Farm in Puguis, La Trinidad, Benguet, a beneficiary of the project, his place is currently undergoing continuous development into an agro-organic eco-tourism destination. “Our purpose here is to create awareness among our consumers, customers, or clients on the consumption of organic vegetables. At present, my farm offers home-stay that can accommodate about 10 people or about 20 to 30 walk-in farm visitors. 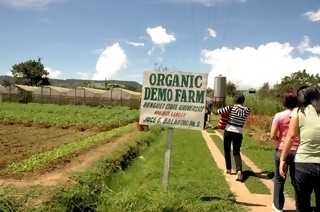 We can offer them tours around the farm, lectures on basic organic farming; tasting our freshly harvested safe, healthy, and nutritious naturally grown vegetables and other local cuisine as well as a market site for them to buy organic veggetables that they can bring home to their families,” Laruan said. There are about nine organic farms that are developing their farms to be eco-tourism sites in the province under the project, he added. In a statement, Monina Hernandez of the AusAID Philippines-Australia Community Assistance Project (PACAP) lauded the said JVOFI initiated project as it does not only addresses the environmental protection aspect, but it also aims to address poverty alleviation by providing alternative livelihood for organic farmers.